Recently, OSU South Centers farm manager Wayne Lewis and Dr. Rafiq Islam visited Ukraine to establish a long-term CLIMATE-SMART agricultural research experiment. The goal of our research is to develop climate-smart agricultural management practices based on novel and holistic approaches of crop diversification (rotation and cover crops) with plant stress alleviator (salicylic acid) under continuous no-till that helps improve soil quality, water- and nutrient-use efficiency, reduced greenhouse gas emission, and economic crop productivity with enhanced agroecosystem services. Soil, crop, water, greenhouse gas emission, input, and climatic and economic data will be collected and analyzed to deliver the project outcomes and outputs. 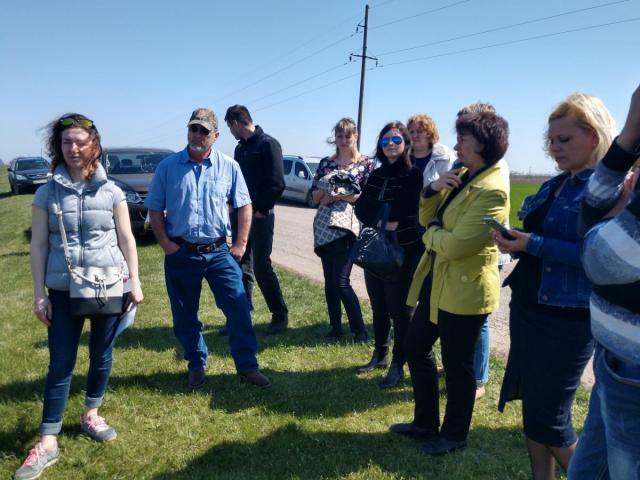 Proven traditional and electronic outlets will be used for outreaching Ukrainian clientele (both educators and farmers) to show agriculture is not the problem, but a part of the environmental solution. The project was funded though the Civilian Research Defense Foundation under US-Ukraine Research Collaboration. Rafiq Islam the US Principal Investigator and Dr. Natalia Didenko is the Ukrainian Principal Investigator for the project. The Soil, Water and Bioenergy Resources Program is conducting the field research in conjunction with scientists from the Institute of Water Resources and Land Management (Ministry of Agriculture), Institute of Irrigated Agriculture, Askaniya State Agricultural Experimental Station, and Brylivske state farm. Professor Vozhehova R. Anatoliivna (Director), Dr. Maliarchuk M. Petrovich (Main Scientific Researcher), Maliarchuk A. Sergiivna (Senior Researcher), and Biliaeva I. Mykolaivna (Department Head) from the Institute of Irrigated Agriculture; Melnik Andrej (Chief Agronomist), Nadia Reznichenko (Scientific Secretary), Vira Konavalova (Junior Scientist), Natalia Galchenko (Director), Victor Naydenov (Director), Oleksandr Knyazev (Chief of Laboratory of Agrotechnology), Tetyana Levenec (Junior Scientist), and Sergij Roj (Junior Scientist) from the Askaniya State Agricultural Experimental Station; and Cherevychnyj Yurij (Head of the Research Fields) and Kiberlenko Ivan (Director) of the state farm Brylivske, will be working with us as members of the team. As part of the research activities, both Rafiq Islam and Wayne Lewis delivered presentations and conducted interactive discussions on no-till system, mono-cropping with corn or soybeans, corn-soybean-wheat cropping diversity with summer and winter cover crop blends maintain soil moisture, control weeds, provide home-grown nitrogen, reduce soil compaction, and improve soil quality. They also discussed the effects of salicylic acid on improving the drought tolerance capacity of crops. Both demonstrated to their Ukrainian collaborators how to measure compaction, soil pH, moisture content, and soil quality in the field using simple equipment and the OSU Soil Quality Field Test Kit. Finally, the field experiment was established to test 2 tillage systems x 2 cover crops x 2 salicylic acid treatments with three replications on 45 acres of irrigated lands at the “Askaniya” State Agricultural Experimental Station and state farm “Brylivske” under in Kherson Oblast, Southern Ukraine.